A painting by Robert Dowling. More of his work can be found here. 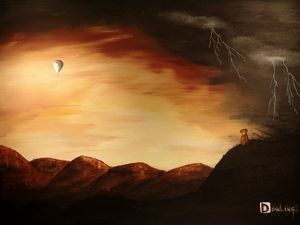 "Come away..." the balloon cried, its whisper voice blending with the soughing wind. "I have to stay here," said Teddy. "My boy needs me." "You will be forgotten..." whispered the balloon. The shadows deepened as the sun sank lower in the sky, and Teddy shivered. To be abandoned, forgotten? He could dream of no worse fate. “I’m staying here,” he shouted at the dwindling balloon. “For as long as I’m wanted!” Balloon laughter floated back to him. “You’re doomed… Doomed to rot alone, doo-…” The balloon popped suddenly as the altitude overcame it. Below on the hill, Teddy laughed delightedly. The third level of Hell is reserved for the gluttonous. Dante described it as a place of eternal storms, accursed, heavy and cold. Pooh, being a bear of very little brain, had no idea why he was there. What he did know, however, was that there was a hunny tree in the valley below. A plan slowly took form. “Why not?” he asked himself. Pooh drifted over the Hundred Acre Wood, hanging from the balloon string. Christopher Robin had not visited for weeks, and Piglet had become worried. So they set off to find him, Kanga bounding to the south, Tigger sproinging to the east, Rabbit hopping north, and Pooh carried west, aloft again, and more frightened than ever. The sky was stormy as Pooh reached the border of the Hundred Acre Wood. Shocked, Pooh let go the balloon and fell to the ground. He stared uncomprehendingly at the barren wasteland, scoured of all evidence of life by nuclear fire.